Last week, I had the privilege of taking newborn photos of baby Asher and his sweet family! These guys are familiar faces on the blog. In fact, you may have seen Jon and Kristen's Maternity session on the blog just a few weeks ago! Also, I want to mention keep Kristen's mom in your thoughts and prayers. 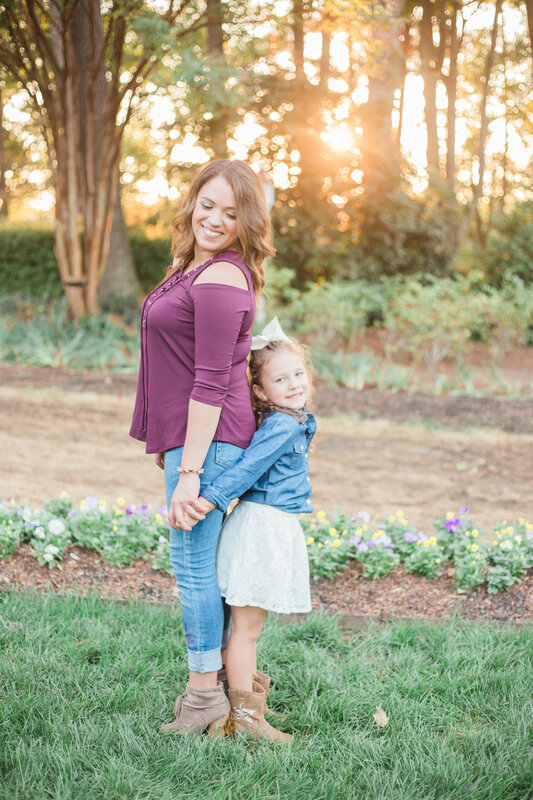 Recently, her mom was diagnosed with a malignant, inoperable brain tumor. This is the sweetest family ,and I know they would appreciate your thoughts and prayers! Also, I'm going to leave a link to her fundraising page in case you are able to help financially. Enjoy the photos from this sweet session! When Danyelle reached out to me early in the fall to take her and Paisley's pictures again I was so stoked! Last year, when I first met them, we did a fun session in downtown Raleigh! We decided this time around, that the Azalea Gardens would be the perfect location for this. When we got to the shoot, Paisley's best friend was there too so we got some adorable best friend pictures! Kristen and I have been friends since we were little girls. I'm pretty sure she is the first friend's house I ever slept over at and vice versa. Shooting her and Jon's pictures is always special to me because of Kristen and I's history. When we were teenagers, we spent lazy days by her pool tha.t was within walking distance of my house. I'm pretty sure the summer between our junior and senior year, that I was at her house nearly every day. We would talk about college plans, boys, future hopes and dreams. It's laughable now that we're living the future hopes and dreams part of our lives. We're both married now and she already has one boy with another sweet fella on the way. Zeus, our Shih Tzu, of course is my baby for the time being, but I digress. I'm very excited for these two as they bring their second child into the world. I can only imagine how exciting it must be to watch your family grow. I cannot wait to take Baby Stallings newborn pictures when he arrives. A few weeks ago, I had the privilege of shooting my husband's cousin's senior portraits! She and her mom traveled up from where we used to live in South Carolina to meet us at the American Tobacco Campus in Durham, NC. They had seen some of my previous shoots there and loved the location. I definitely think it ended up being the perfect location for her! One thing Meredith and I have in common is our love of all things Lilly Pulitzer. I'm sure you'll notice this in her outfit selection ;) I was a big fan! I had so much fun with this shoot!